Types of Ramen: Ramen is a noodle in soup dish which originally made its way from China into Japan when the country reopened its borders during the Meiji Restoration. The dish was refined and improved to such an extent over the past century that it has all but overshadowed its original Chinese cousins on the world stage. 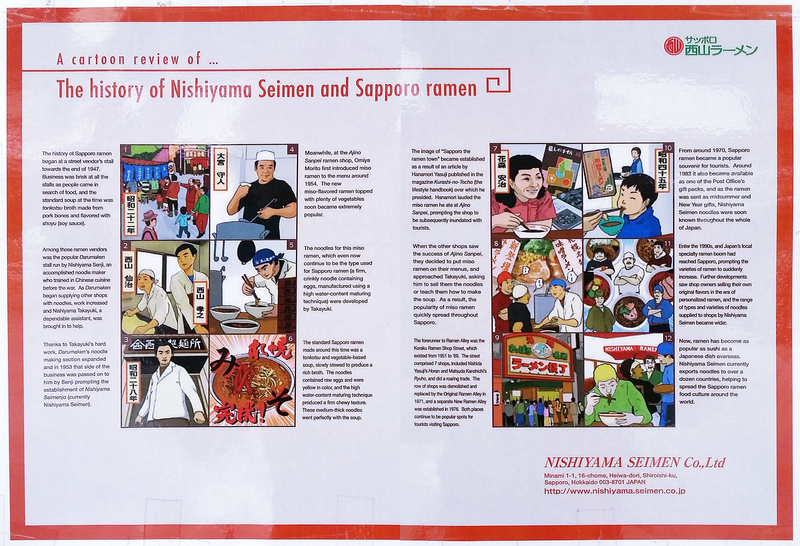 The world of Ramen is pretty complicated and this post will systematically categorize the different styles of Ramen that are common in Japan along with their various soup flavours, broth types, accompanying meats and toppings. It doesn’t teach you how to cook Ramen, but you’ll know how to order different types of Ramen at a restaurant or recognize the various types at the supermarket. The word ‘Ra’ means pulled (into) while ‘Men’ means noodles. That’s how the noodles were made in the old days, a single lump of dough was manually stretched and folded in half dozens of times til it formed a bunch of thin noodles. The noodles are machine made today but the dough is still made from the same basic ingredients: flour, salt, normal water and an alkaline mineral water called kansui. It is the kansui which give Ramen noodles their unique bounce and taste and it also makes them yellow even though they contain no egg. As raw ramen noodles are alkaline and have some flour dusted on them, they have to be boiled separately from the soup. If you would like to try making your own ramen noodles from spaghetti I have a recipe here. Ramen noodles come in many different varieties but they essentially belong to one of two types, low or high alkaline. The low alkaline noodles are thin and straight. They have a stronger taste of wheat, and have a heavier texture. They also tend to get soggy faster. The high alkaline variety are a brighter yellow colour, have a lighter feel and are more springy. They also add a layer of flavour as they have a taste of their own. Wavy ramen and thick ramen noodles belong to this second category. There is lots of debate over which type of noodles go best with which kind of soup and many say thin soups should go with the thin noodles cause they have higher surface area etc. , but you needn’t worry too much about this, the Ramen shop will typically pair the noodles with the soup for you and you rarely get to choose. There is a tradition in some shops to allow you to add extra noodles halfway while eating (called kaedama) but I recommend against this as the soup is not really hot enough by this time. Some others allow you to add rice to the left over soup, this I think is the better idea. Basic ramen broth does not have too many ingredients. It is usually made from pork bones, chicken bones or a combination of the two. In certain recipes dashi, which is a consommé made from Bonito(dried salted tuna) flakes or Niboshi(dried salted anchovy) is simmered with Konbu(a kind of kelp) and blended into the meat broth to create a purer clear broth. Fresh seafood may be used occasionally in certain regional varieties, but usually not beef and probably never mutton. For Ramen, broth and flavour are distinct and separate. This is one of the unique things about Ramen. Think of it as: broth + flavouring = soup. 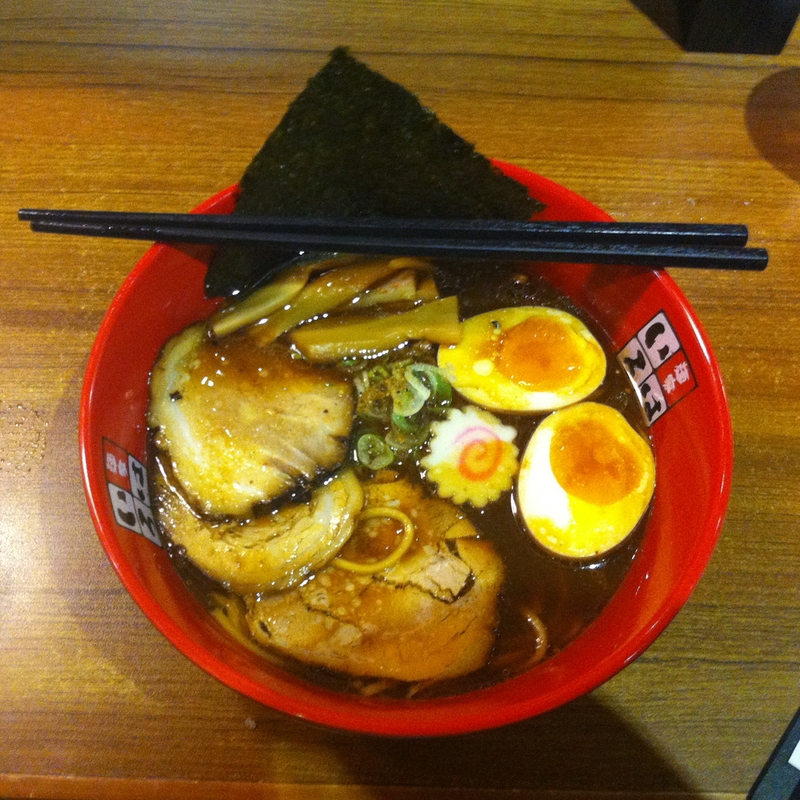 A Ramen is usually defined by its flavour which affects its final taste. There are 4 primary types of Ramen soup flavours: Shio, Shoyu, Miso and Tonkotsu. means salt and this is traditionally the way Ramen soup is flavoured. All Western broths would be considered of the Shio type. The salt doesn’t affect the appearance of the broth and therefore Shio soup tends to light coloured and clear. Shio flavoured soup will tend to be a tad saltier than the other types. means soy sauce and this is next oldest flavour type. Instead of salt, a sauce made by fermenting soya beans is used to make the broth salty. This sauce is not your regular table soya sauce, but typically a special sauce with additional ingredients made according to a secret recipe. The broth for Shoyu is the only type that tends not to contain pork. Shoyu soup is also usually clear, but is dark coloured and sweeter than Shio soup. In more recent times, Miso paste has also been used to give Ramen broth its savoury taste. If Miso is used, it is immediately obvious as the soup will be opaque. Shio or Shoyu flavoured soups merely accent the flavour of underlying broth, while miso leaves a fuller complex taste in the mouth since it also has a strong taste of its own. is technically not a true flavour since it is contains either salt or soy sauce. It is made from boiling ground up pork bones (ton=pig, kotsu = bones) for 12-15 hours till all the collagen has dissolved into the stock as gelatine (details here). The result is a rich whitish soup that is distinct enough to consider Tonkotsu as a separate fourth flavour of Ramen. To be clear, the use of pork bones does not automatically mean the soup is of the Tonkotsu type. If the pork bones are boiled whole for a relatively shorter period, the result is just regular pork broth. The most common type of meat served in Ramen is Chashu which is another type of food borrowed from China and subsequently modified over decades. It is basically a pork belly tied into a cylinder, braised and then served in slices. What the pork is braised in differs from recipe to recipe but general ingredients include soya sauce, sake, mirin and sugar. In my humble opinion, the Chashu is the hardest part to get right in a Ramen. Chashu often goes hand in hand with Shoyu Ramen since the braising liquid can form part of the ‘shoyu’. Sometimes the pork belly is braised in its original shape but also sliced. You can refer to my own oven braised Chashu recipe here. Another item that one finds in their Ramen more often than not is Ajitama, a soya sauce seasoned boiled egg with its yolk still runny. The Chashu braising liquid also comes in handy when seasoning these eggs. Ramen can also be served with fresh seafood, Kamaboko(a bouncy fish cake with a characteristic pink swirl) or with no meat at all. Unlike for soba or udon soup noodles, slices of beef are rarely served with Ramen, although new age Wagyu Ramen has been making an appearance lately. 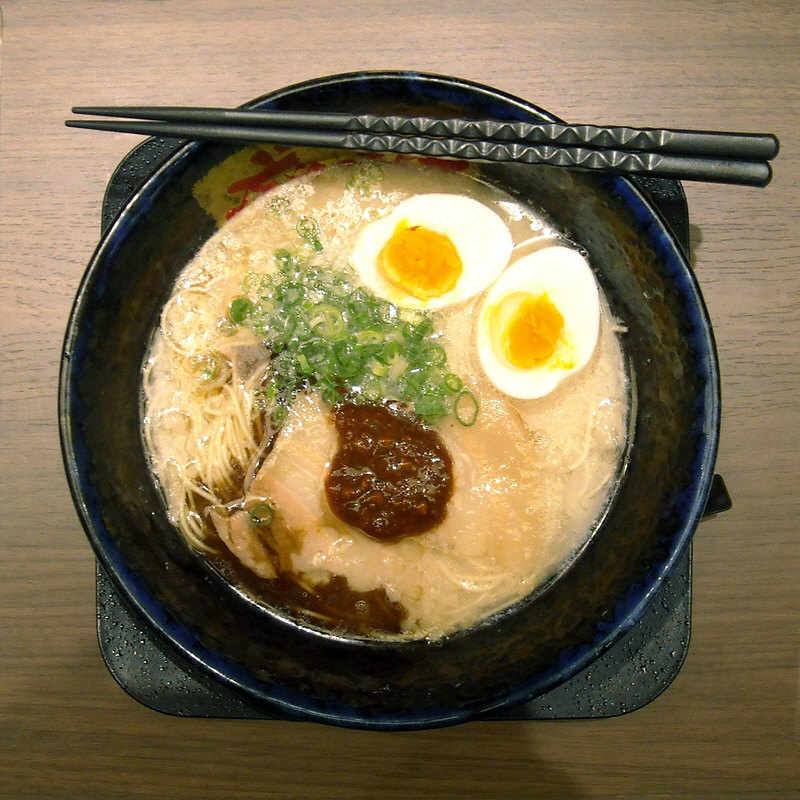 Whilst the number of possible ingredients used for Ramen broth is quite limited, a large variety of ingredients are used as toppings to differentiate one Ramen from another. The more common toppings include Nori (a type of seaweed paper), Wakame (a type of rehydrated seaweed), Menma (preserved bamboo shoots), Negi (scallion), Kikurage (black fungus), juliened leek, sesame seeds, fried garlic and pickled plum/ginger. A lot of Ramen shops will also top off with a proprietary spicy sauce or a ball of spicy miso to give a kick to the soup. This way customers can chose how spicy they have their Ramen is. The way Ramen is cooked has more or less evolved over the past century along geographical lines. Tonkotsu is the primary flavour of Kyushu Island in the South while Miso is generally associated with Hokkaido Island in the North. The central island of Honshu is home to the Shoyu flavour. Even within these demarcations, local variations have sprung up and are known by their city or prefecture of origin. Many of these variations feature local produce that is famous nationally. 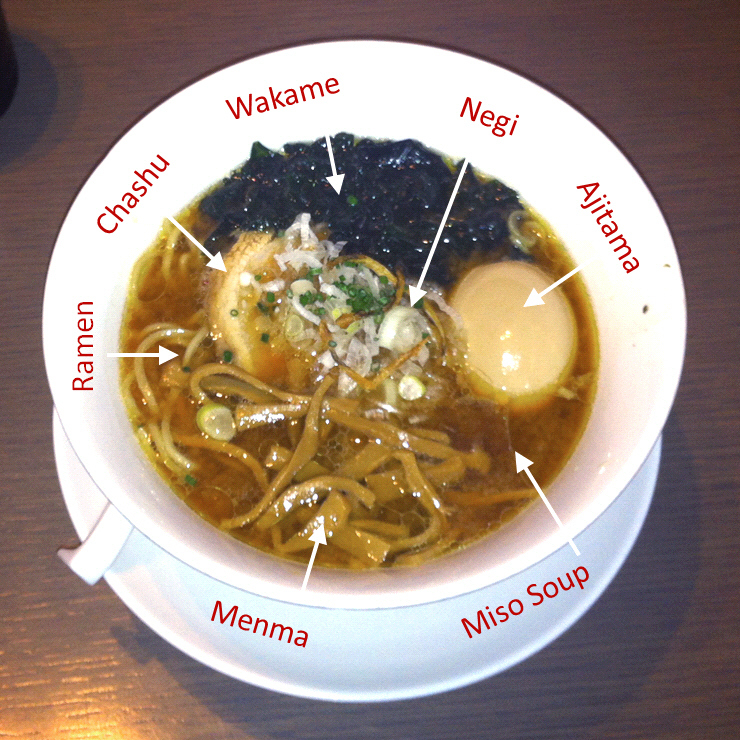 The following is a list of the main varieties (that I have come across anyway) of Ramen. Tokyo style Ramen is the archetypical Shoyu flavoured Ramen. Many Ramen stalls originally served soba in a dashi soup and when the use of Shoyu was introduced, the practice of using dashi was retained. Today chicken stock and shoyu is mixed with dashi to produce the unique Tokyo style Ramen. Tokyo Ramen is usually served with Chashu, Kamaboko, half an Egg, and is topped with chopped leek and preserved bamboo shoots. In Yokohama, the port of Tokyo, pork is used instead of chicken for the broth resulting in the iekei sub-variation. This is a less well know shoyu type ramen that is distinguished by its combination of seafood and pork into an oily stock. Like all ramen from Hokkaido, it is designed with cold weather in mind. Asahikawa ramen uses roughly the same toppings as shoyu ramen from Tokyo (see above). Champon is a specialty of Nagasaki which was invented by a Chinese cook as a Meiji era equivalent of affordable fast food, for the Chinese students who were studying there. It is the most Chinois of all Ramen and today Champon is served at every restaurant in Nagasaki’s Chinatown The home of Champon is said to be the famous Shikairo in Nagasaki. Champon is practically the only ramen from Kyushu which does not use a Tonkotsu soup. Unlike all other ramen, Champon uses special noodles that are cooked in the soup itself. This ramen is served with a stir fried mix of pork, seafood and cabbage. 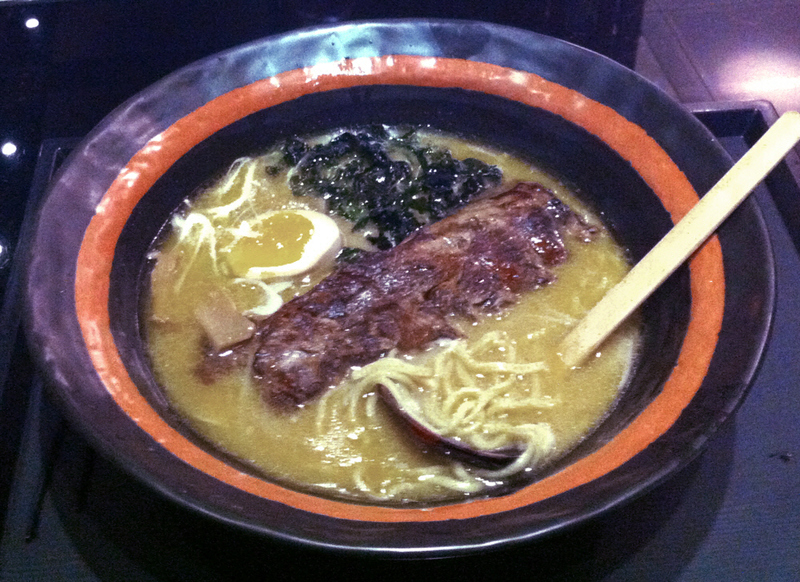 As all ramen was originally Shio flavoured, Shio ramen wasn’t invented in any particular place. However, when one mentions Shio ramen, a bowl of Hakodate style Ramen comes to mind immediately. Hakodate is where the tradition of making ramen soup flavoured with salt has remained unchanged even as new flavours and styles were introduced all over Japan. Hakodate style ramen is usually made with chicken broth resulting in a golden coloured soup. Very often Hakodate Ramen comes with chicken meatballs. Tonkotsu type ramen originated on the warmer Southern island of Kyushu where most of Japan’s pig farming is done. Hakata is a district in Fukuoka City, the biggest city on Kyushu and the style of ramen from there is universally recognized as the standard version of tonkotsu. 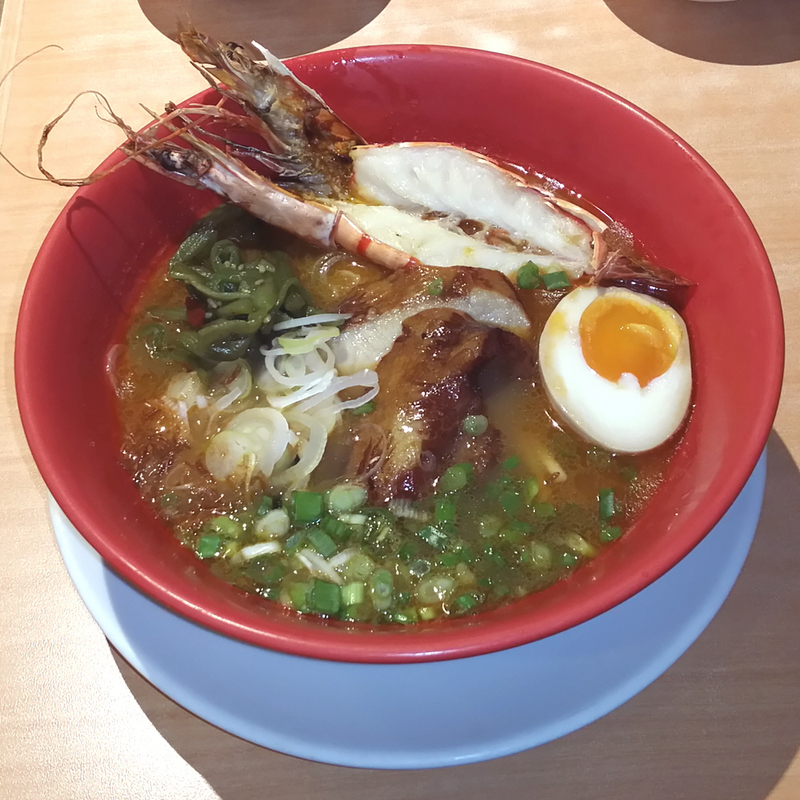 Hakata Ramen is usually topped with Chashu, egg, scallion, sesame seeds and pickled ginger. A close cousin of Hakata Ramen is Kurume(Koo-Roo-Mare) Ramen. This is thought of as the original way Tonkotsu was made before it was modernized into the Hakata style. Its soup is similar but even richer in pork taste (from adding pig’s head, trotters etc. to the broth). The noodles of this variety come topped with fried pig lard bits and dried seaweed. 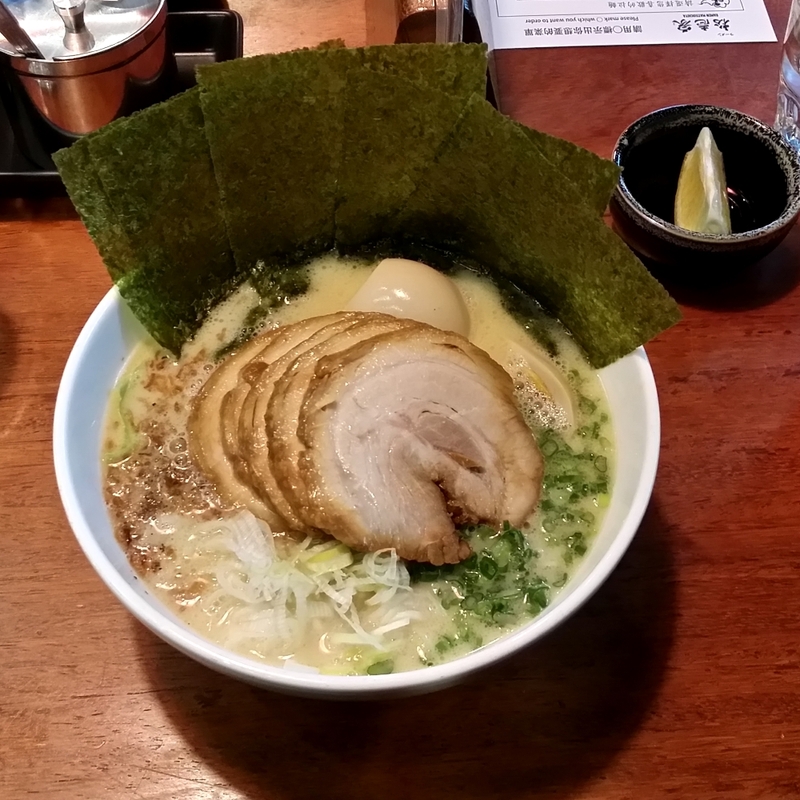 Kumamoto prefecture is in the middle of Kyushu and its style of ramen is yet another variation of the Tonkotsu type. It is served with stewed pork belly, and a generous amount of fried garlic together with the oil the garlic was fried in. Toppings include pickled ginger and julienned leek. Kagoshima is a port at the Southern tip of Kyush. Here the soup is lighter as it is made from a mixture of pork tonkotsu and clear chicken broth. Kagoshima is home to Kurobuta pork, which makes their chashu all the more delicious. Other types of noodles, similar to those from ‘nearby’ Okinawa or Taiwan are sometimes served in place of regular ramen noodles. This style of Ramen has a unique shoyu flavoured soup made from pork broth mixed with dashi made from dried anchovies. It hails from the city of Kitakata in Northern Honshu which purportedly has the highest concentration of Ramen shops in the world. Kitakata style Ramen features flat noodles and is typically served with sliced pork belly, leek and fish cake. style ramen has become common practice. Tokushima style Ramen is the most popular style of Ramen on Shikoku Island, the smallest of the 4 main islands. It uses a combination tonkutsu-shoyu soup which is deep brown in colour. 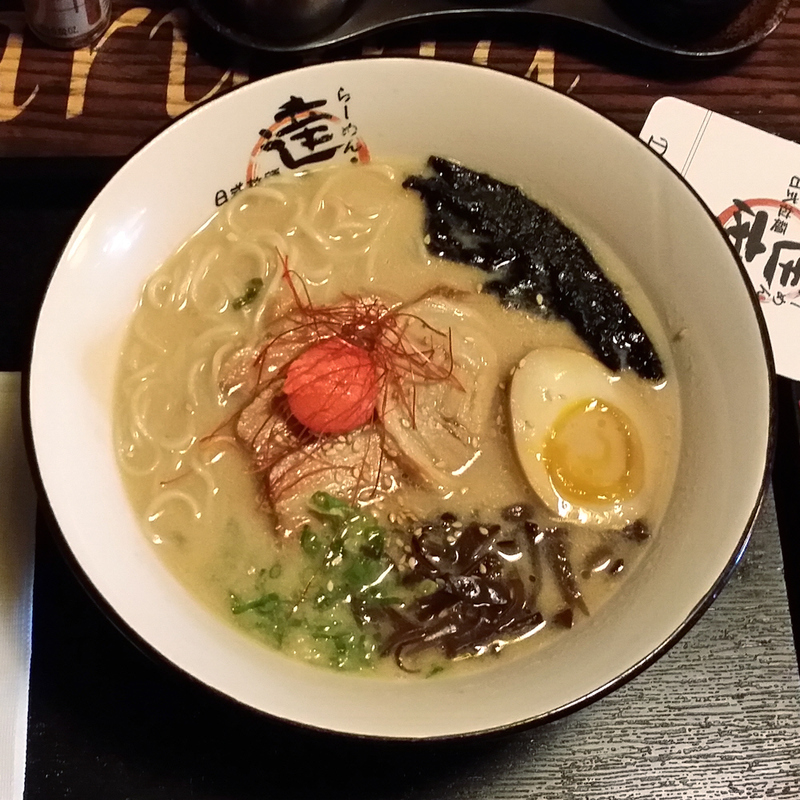 This ramen is served with a raw egg instead of an almost-cooked one. The other special thing is it is served with baraniku, a kind of stewed pork rib. A sub-variation of the Tokushima style is Wakayama style Ramen. Wakayama is on the main island of Honshu, just across the inland sea from Tokushima which is probably why Wakayama Ramen can be described as a Tokyo style Ramen served in Tokushima soup. For instance it will be served with a boiled runny-yolk egg instead of a raw one. This is a form of ramen where the noodles comes dry in a plate. The stock is concentrated into a thick soup and is served separately. The idea is to bathe each mouthful of noodles in the sauce before immediately eating them, which is why Tsukemen is usually translated as Dipping Ramen. 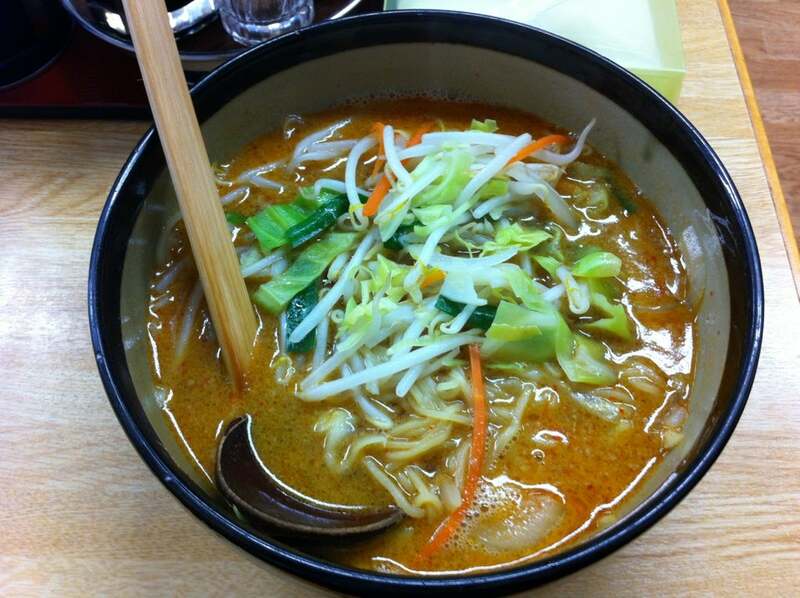 There is no traditional flavour to the soup, and this just depends on what soup the ramen shop specializes in. The are two reason certain people prefer tsukemen; firstly the flavour is quite intense (but not more salty) compared to normal ramen and secondly the noodles are sort of lukewarm instead of piping hot when you eat them, so you can eat this really fast. This last category of Ramen covers those noodles served in non-traditional soups and thus don’t fall under any of the regional styles above. One popular variety is the Ebi Ramen, where a meat stock is fortified with prawn heads, giving it it’s characteristic reddish hue. This prawn soup is unlike any other kind of ramen soup you have ever tasted. Besides the standard condiments Ebi Ramen is also topped off with some unusual ones like deep-fried shallots and sakura shrimp. One famous shop known for this type of Ramen is EbiKin; it is located just outside the (old, not sure if the market has moved yet) Tsukiji Fish Market in Tokyo. If you would like to try making this style of ramen, I have a recipe here. The other type of nouveau ramen I really like is Torikotsu Ramen. The stock of this type of ramen is made in a way similar to Tonkotsu but using chicken instead. After a long boiling time the resulting soup is similarly milky, heavy with gelatine and strong in meat flavour. This distinguishes it from the Hakodate style soup which is also made from chicken, but is clear. Torikotsu is typically topped with things like fried shallots, cabbage, scallion and perhaps a wedge of lemon. In some cases even the accompanying Chashu can be made from chicken as well. To try this type of less-common ramen, may I suggest a small Ramen chain in the Yokohama area called Matsuichiya. If you would like to try making this style of ramen, I have a recipe here. In this final section I am going to discuss home-cooked Ramen. Quality ramen from the supermarket normally comes in rectangular 2 serving packs. If they are available, they will be found in the refrigerated (not frozen) section. The packing will generally indicate the style (e.g. tonkotsu on the yellow pack) of the ramen. If its a really good product, there will be a picture of a famous Ramen chef whose recipe the product is based on. The noodles are soft, sealed seperately within and the instructions will tell you to cook them separately from the soup. The soup will come in the form of a large pouch containing a condensed soup paste. You’ll need to procure all the meat ingredients and condiments yourself separately, resulting in an authentic ramen. If you don’t have any chashu lying around the house, try pan-fried luncheon meat (please do not quote me on this) and perhaps some seasoned runny yolk boiled eggs made according to my recipe. The easiest condiments to use are perhaps Japanese dehydrated kelp, dried seaweed sheets and sesame seeds. You can pre-combine some as described here. A second type of noodles is the off-the-shelf ramen-style soba stick noodles. Technically buckwheat soba noodles means this is not a true ramen but the soup pack that comes with with them is a concentrated form of a recognized ramen soup. These stick noodles also come in dual servings. 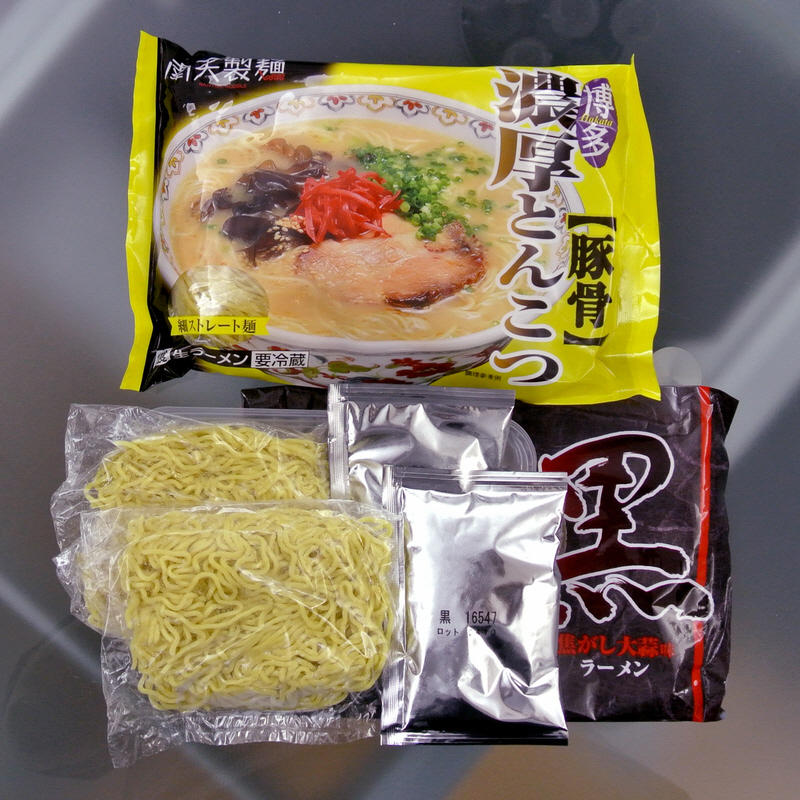 The packaging will be flat and long, and typically indicate the regional style (Kumamoto, Kagoshima, Nagasaki from left to right in photo) of the soup, often with a map even. It’s not as good as the quality ramen above but on the plus side, they keep for a long time and don’t need to be refrigerated. If your pack of noodles is the type where you just boil a hard cake of noodles in water or fill a paper cup with boiling water and add some soup powder after the fact, this isn’t ramen at all; its only regular instant noodles. If the noodles are cooked in the soup and not separately, this is a dead giveaway that you’re not making ramen. Besides being hard to the touch, the other tell-tale difference is these inferior noodles are always made with 1 serving. These instant noodles are dried by deep frying them in oil and the soup powder contains a heavy dose of MSG so this type of noodles is not too healthy. The packaging will neither give a ramen flavour nor style, but will be described by the meat (e.g. chicken, seafood) used to manufacture the soup powder. I have tried to imitate “real” ramen using the 10/$1.00 type package. I find pork flavour works best. It is not nearly as good as real ramen and, even with all of Naruto’s favourite trimmings, it has not improved my Ninja skills one bit. I am no closer to Rasengan than ever I was. Heh! The Pork flavour does a fair imitation of Tonkatsu. But by the time you add Chashu and Wakame and all the other trimmings it is already getting more costly… so one might as well just go all the way, it seems. The pan fried factory noodles do not help me concentrate my Chakra at all. Maybe I missed it, but was fish broth ramen ever mentioned in this piece? Some broths might use dried fish as one of the many ingredients for the broth while others might come with mixed seafood but to be honest I have never encountered a ramen using a pure fish broth. This of course doesn’t mean there isn’t someone out there selling fish ramen. If you are into fish broths, what comes to mind is the famous fish head soup vermicelli from Singapore. Speaking of Singapore, a relatively new ramen type gaining popularity is prawn ramen, which has a deep red broth and comes with dried sakura shrimp. This is loosely based on the prawn soup noodles that Singapore is also famous for. thank you for a very informative article, cheers! Can anyone tell me what that very first picture of ramen has in it? It’s all the way on the top and has a creamy white looking broth with various ingredients including seaweed. Thanks! Its ramen from a shop called Nagahama No.1, and this is what they call the Special Number One, a tonkotsu with all the extra toppings. Ironically its No.6 on their menu. You can explore the link below, its not all in English but there are plenty of pictures. Hi, thanks for the great article, very helpfull, I was wondering if beef ramen is a thing? I mean i know the Vietnamese Phô version but is there one that Japan has made its own? I have come across Beef Tendon ramen occasionally but I would generally answer no. The closest thing to what you want is probably Taiwanese beef noodles. I’m not sure if you can help me, but I’m desperate and will try anything! 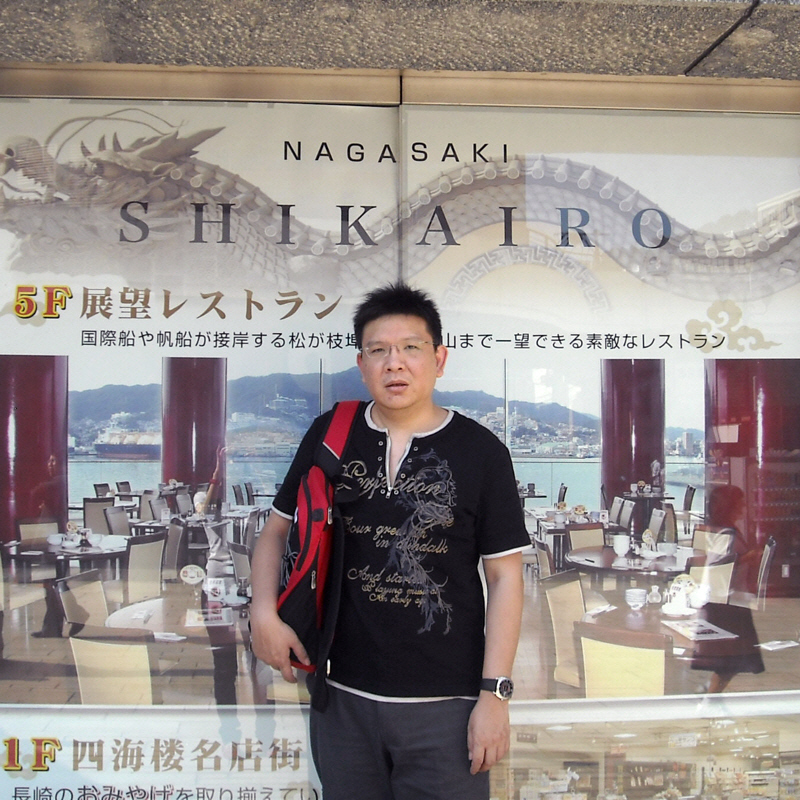 It concerns a wonderful soup I had regularly at Ramen Bayashi in Narita, which the arrival port for Tokyo. As a former flight attendant I would actively bid for Tokyo flights just to enjoy this amazing, addictive soup. Judging by the fact that the little restaurant was always packed with flight crew, I was not alone in my passion. The soup was called Red Chilli Pepper soup, or alternatively “Shisenmen”, and consisted of noodles, cabbage,carrot,probably stirfried in sesame oil, over which the soup base was poured and a little chilli oil added. The soup base had a grainy red consistency , I’m not sure if any other sauces or spices were added. I would imagine the soup base is the key and I’ve tried a number of different combinations of ingredients but have not had any success. I wonder if you could take a look at the image included at the start of my email and work out what style of Ramen this might be. Spicy soup isn’t my thing but I’ll give you my 2 cents worth. Just from the picture, it looks like the soup base is miso. I suspect the missing ingredient might be Szechuan Toban Paste, because red ramen is a concept borrowed from Chinese cuisine. I think that is something you might try. You can find a picture of a bottle at the bottom of this page. You might even want to try a version of the recipe (i.e. without tofu and corn starch) combined with miso soup to get the effect you want. Minced meat is becoming quite common for certain ramen, so it wouldn’t be too much of a stretch.